My goodness… I’ve been lazy on the blog front lately. On a positive note, however, I have been a lot more industrious on the home front lately, and isn’t that more important anyway? Helping Daddy pick cherries in the yard. We have had quite a harvest around the yard this fall. 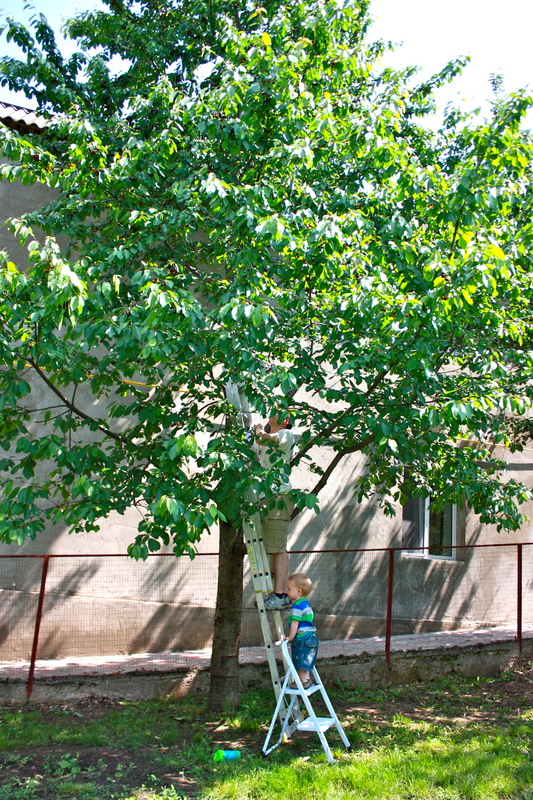 The house where we are living does not have a big yard, but, in true Moldovan style, the perimeter of the small back yard is completely lined with fruit and nut trees. We have 3 cherry trees, 5 plum trees (1 with round yellow plums and 4 with the oblong purple ones), 5 apple trees, an apricot tree, a peach tree, a walnut tree, and one little tree that I can’t remember what fruit it bore. In the front of the house, we have another apple tree (this one was really our big apple producer- it had so many huge green apples), 3 walnut trees, and a couple of grape vines. The grapes are pretty much wild, they just grow all up the side of the carport and into the trees and we really didn’t know how much they would produce, but we got quite a harvest of tart green grapes! We also planted 6 tomato plants in a little patch of dirt beside the house. 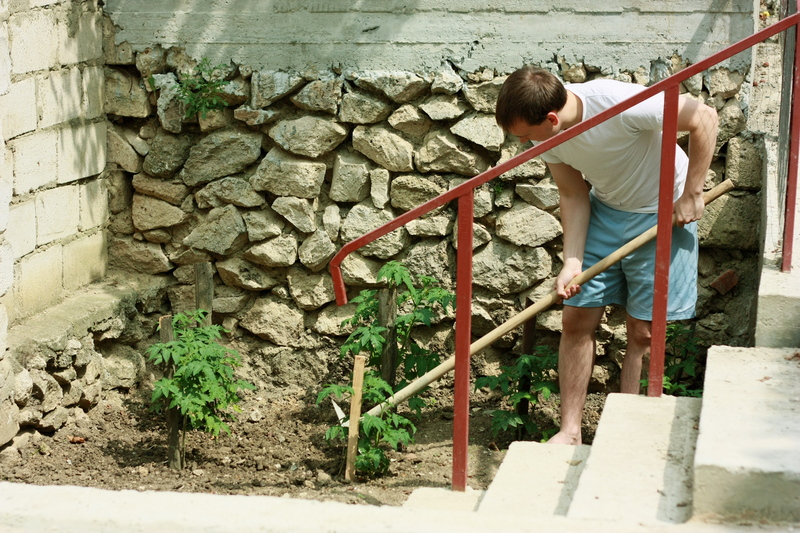 Josh hoeing our tiny tomato garden. We were traveling when most of the plums and the apricots were ripe, so we missed out on those, but there is one little plum tree hidden underneath the walnut tree that wound up with a huge late crop of delicious sweet plums. Knowing that we couldn’t use all of the plums and walnuts, I kept a few for us, and then a group of students from the school came and picked the rest of the plums and walnuts to take back for them to enjoy. So what else did we do with such a bountiful harvest? Not as much as I’d hoped, but given how busy our summer was—2 weeks of family visiting, 2 weeks of staying at the northern camp, and 2.5 weeks of vacation—I’m fairly happy with how domestically productive we were able to be. Cutting apples for apple butter. In addition to the things from our yard, I also bought apricots, strawberries, and tomatoes (not at the same time) from the market and made apricot compote (a popular fruit drink in Moldova) and Stephanie taught me how to can strawberry jam and salsa. Stephanie, her daughter Angela, and I made 6 quarts of salsa together, which we halved between them and me. Then a couple of weeks later, Josh and I decided that we wanted more and made a whole ‘nother batch of salsa by ourselves! 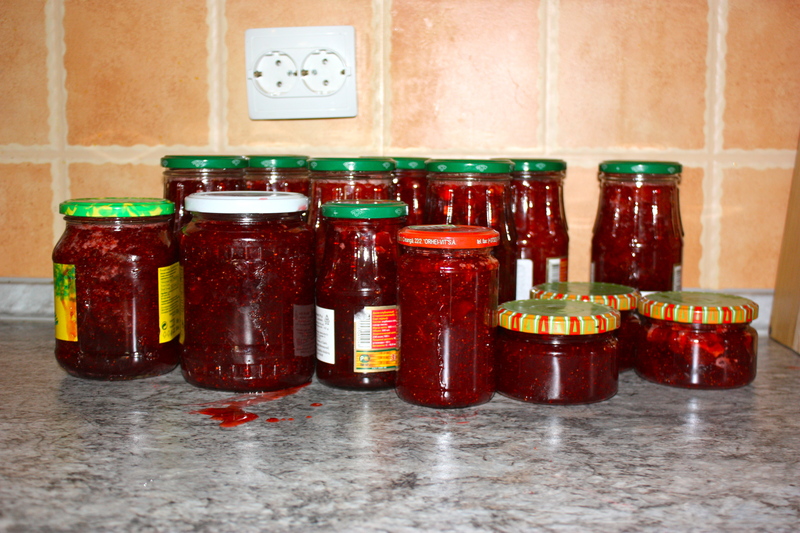 My first-ever batch of homemade strawberry jam. And I have to brag on my husband for a bit too, because not only was the grape jelly completely his baby (all I did was sanitize the jars for him), but in the last month or so, he has started craving his mom’s homemade sourdough bread. With me being gluten-free, he knew he couldn’t ask me to make it for him, so he made his own starter and has been making delicious sourdough bread (I’ve cheated and tasted a piece or two). 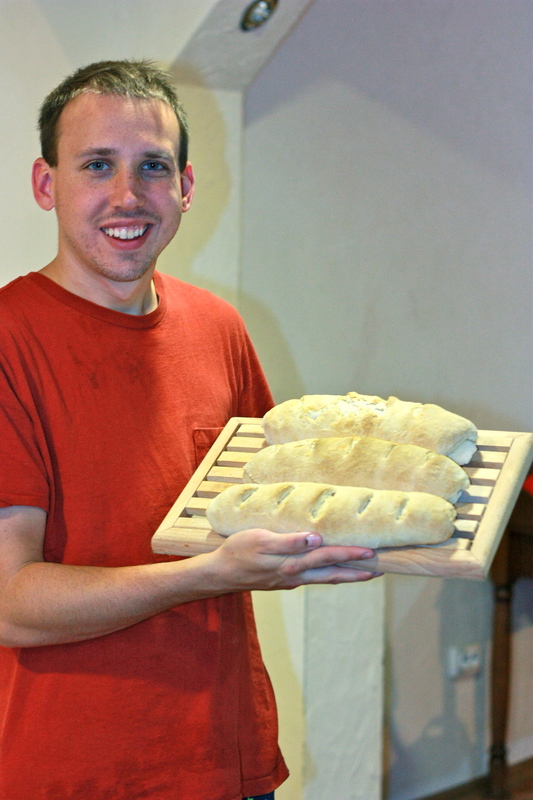 Josh showing off his homemade sourdough bread. I love it :) Praying for you guys so very often!! !